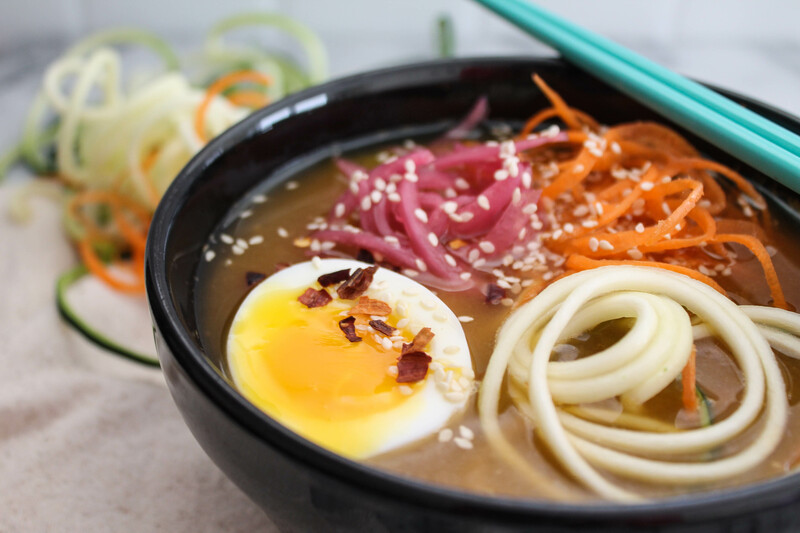 When you’re just craving a light broth and some vegetables, this recipe for Vegetarian Asian Noodle Bowl hits just the right spot. Just eight ingredients and you’re on your way to a bowl of fresh, light broth that will soothe your body and soul – perfect for those days when you’re feeling under the weather! If you live where winter is a defined season in your neighborhood, I bet you have two cravings: soups and more soups! I know I do, living here in New England. But I can go two ways with said soups. One, when I’m starving and want something incredibly hearty and filling, like a beef stroganoff or braised ragú. Two, are those times when I’m not really feeling like simmering a pot on the stove for hours and want something vegetarian, light and yet just as warming to the body. That’s where this Vegetarian Asian Noodle Bowl comes in. Eight ingredients is all you need to make this bowl and I assure you you’ll be making it on a weekly basis, it’s so easy. Obviously, the key ingredient is a good broth to start with, since like I mentioned, I sometimes don’t have all the time in the world to make soups and stocks for hours. And before I even continue, let me just say this isn’t a sponsored post because I’m about to mention the brand I use as my go to stock and soup cravings: Pacific Foods. It is, in my opinion, the tastiest and cleanest brand of soups, stocks, and broths in the market, and what I always pick up at my local Stop & Shop. So – you can either check them out or use whatever other vegetarian broth you have available to you. In this recipe, I used their Vegetable Broth and goodness, it was the quickest soup ever but tasted like I had simmered it for hours. Two other shortcuts I used: ground powdered ginger and garlic paste. They pack a ton of flavor with minimal effort as well, which is the point of this recipe. Add a drizzle of sesame oil and you’re in business. Now, let’s talk quickly about the vegetables here. If you don’t own a spiralizer, you can just thinly slice all the vegetables, but let me just make the case of this trendy kitchen tool: it’s a LOT faster to prepare vegetables if you spiralize them – even as a chef and my knife skills are on point if I do say so myself, what this little tool can do is quite magical. Consider investing the $20-30 it costs and save a lot of time if you cook any type of meals, vegetarian or not! 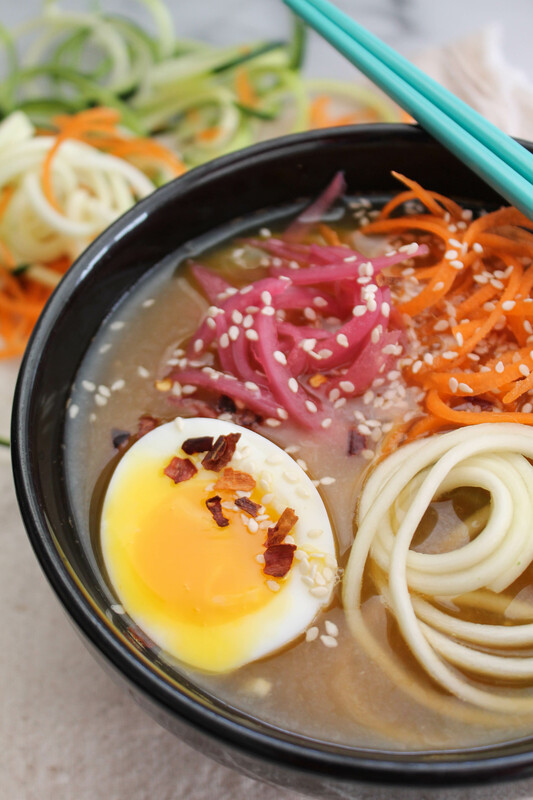 Now, what rounds out this Vegetarian Asian Noodle Bowl recipe is the six minute egg. And before I get comments that eggs aren’t vegetarian, I’m talking to the general population that still includes them in their diet even when on a vegetarian diet. If you’re a full vegetarian or vegan, obviously just leave out the egg! That gooey delicious egg that’s cooked in a rolling boil of water for six minutes, dunked in an ice bath, and carefully peeled. 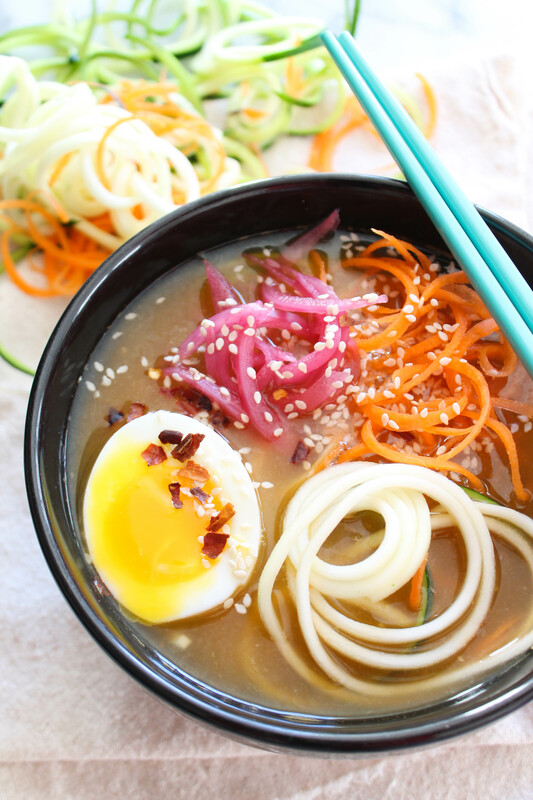 Slice to reveal a golden yolk that when swirled into your broth, makes all your dreams come true. I hope you give this vegetarian recipe a try and come back to tell me how much you loved it – we sure did! In a small stock pot, simmer the vegetable broth with garlic, ginger, and sesame oil. In the meantime, make a 6 minute egg: in a small pot bring water up to a hard boil and carefully drop the egg in with a spoon. Set a timer for six minutes and prepare a bowl with ice and cold water. Once the timer is done, remove the egg from the boiling water and dunk in ice water for 10 minutes. While the broth heats up, spiralize the zucchini and carrots. 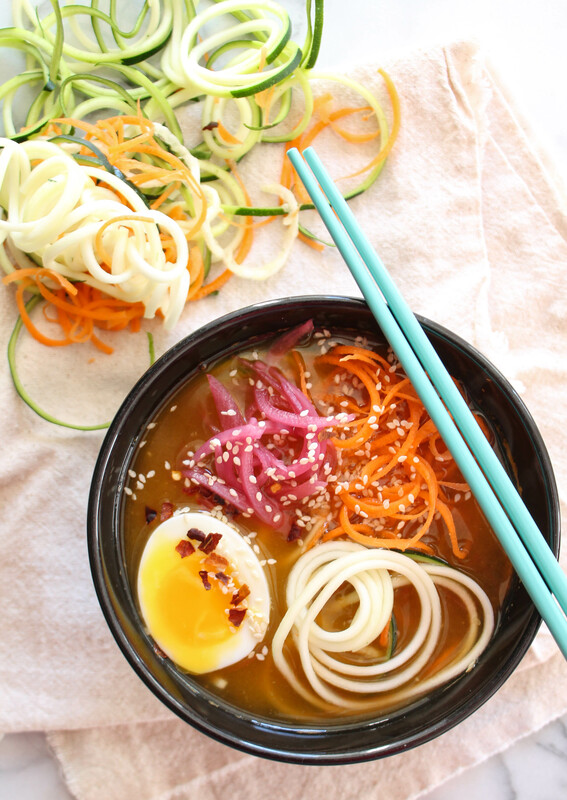 To serve, place zucchini and carrot noodles in bottom of a bowl, top with hot broth (this will slightly cook the vegetable), pickled red onion, and half an egg. Sprinkle with sesame seeds and crushed red pepper flakes. Serve immediately.